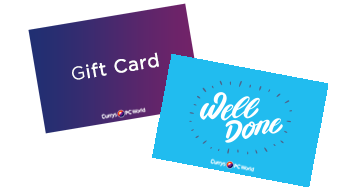 For the perfect gift for any occasion – buy a Currys PC World Gift Card or eGift card online HERE. With a great range designs to chose from and any load value available up to £250 on an eGift and £500 on a Gift card. Purchase a gift card in store , where any value up to £1,000 can be loaded onto a gift card. For gift cards orders under £5,000, buy online . All of our gift cards can be redeemed in store or online. During the checkout process under the gift card section you will be asked to enter your gift card number and pin. Once you have inputted your gift card number and pin and selected add, your available balance to use will be displayed. You can amend the balance by clicking edit. If you don't use the full value of your gift card, the remaining balance will be left on your card. The expiry period for the card is detailed on the reverse of the card. See below for terms and conditions for your card. If you return your product which has been purchased by gift card you will receive a refund back to a gift card. In most instances a new gift card will be sent to you. All of our eGift cards can be redeemed in store or on line. During the checkout process under the gift card section you will be asked to enter your gift card number and pin. If you don't use the full value of your gift card the value will be left on your eGift card to use at a future date. The expiry period for your eGift card is detailed on the reverse of the card. See below for terms and conditions. If you return a product which has been purchased using a gift card you will receive a refund back to a gift card. If your order has already been confirmed a new gift card will be sent to you by post to the address entered with your purchase. To check your gift card balance please click here . You will need your 19 digit gift card number to check the balance. The terms and conditions listed below govern the use of your Carphone Warehouse Promotional card, please read the terms and conditions carefully. By using the card, you agree to be bound by the terms and conditions set out below. How to use the card: The card can be used as full or part payment. No change or refund will be given; any remaining balance can be used against future purchases. This card can be redeemed in a Currys & PC World store, Dixons Tax Free* or online at currys.co.uk and pcworld.co.uk as full or part payment towards our products or services. The amount of credit added or deducted and the card's balance will be shown on the till receipt for in store redemptions. No change or refund will be given. Any remaining balance can be used against future purchases. If upon 6 months from date of issue no credit or debit has been made to the card, the card will expire and any balance will be deducted. Transactions may only take place when the card is presented. The card is not a cheque guarantee, credit, store or charge card. The card cannot be exchanged for cash. We reserve the right to amend the terms and conditions or discontinue the card at any time. This does not affect your statutory rights. Issuer: DSG Retail Ltd, 1 Portal Way, Acton, London, W3 6RS. Used to buy other vouchers or gift cards. Used to buy anything that is not standard rated for VAT; examples of this include energy saving devices for the home, coffee pods and similar products. Used at our airport-based Dixons Travel stores. Topped up with more money (if you bring goods back for a refund you will be given a new promotional card with to the value spent from this card). 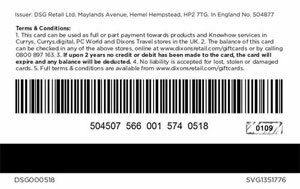 This card can be used as full or part payment in Currys/PCWorld (not Dixons Travel) or online at currys.co.uk or pcworld.co.uk for any goods or Team Knowhow services that are taxed at the standard rate of VAT. The terms and conditions listed below govern the use of your DSG Promotional card, please read the terms and conditions carefully. By using the card you agree to be bound by the terms and conditions set out below. How to purchase a card: Promotional cards are only available in store and online during specified promotional periods and in conjunction with the purchase of a product or service. As such, Promotional Cards cannot be purchased as a stand-alone Promotional Card in store or online. Promotional Cards cannot be topped up. To check the balance on your card click here or call 0800 897 163. Alternatively, present your card in store where a member of the store team can check your balance for you. The Promotional Cards can have varying expiry dates, please check the front or back of your Promotional Card for this. If the Promotional Card is not used within the specified time period the card will expire and any balance will be deducted. * Cards issued, as part of an insurance claim or through a benefits scheme cannot be used in Dixons Tax Free. The terms and conditions listed below govern the use of your Currys PC World Gift card, please read the terms and conditions carefully. By using the card you agree to be bound by the terms and conditions set out below. How to purchase a card: Gift cards are available in store or online. For in store purchases, present the card at any till point. Inform the cashier how much credit you wish to add to the card. For online purchases, please click HERE. You can Top Up your card any time in store. Our Currys PC World eGift cards cannot be reloaded. Upon 2 years non-use, the card will expire and any balance will be deducted. Protect the card and treat it as cash. No liability is accepted for lost or stolen cards or any credit amounts on this card. The terms and conditions listed below govern the use of your Insurance Replacement Card. It has been issued to you in settlement of your insurance claim. Please read the terms and conditions carefully and keep them safe. By using the card you agree to be bound by the terms and conditions set out below. 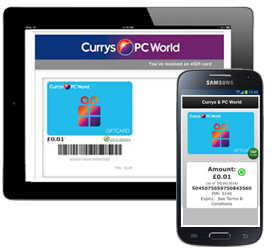 How to use your card: You can use your card as full or part payment towards products and services at Currys or PC World. What to do if your card is lost or stolen: Contact your claims handling unit immediately. DSG will check your balance and issue another card with the value of the original card, subject to the following; DSG cannot be responsible for funds used without your knowledge or issue a further card where the original balance has been used. The original card will no longer be valid. Valid DSG Insurance Replacement Cards can be redeemed in a Currys & PC World store or online at currys.co.uk and pcworld.co.uk as full or part payment towards our products or services. The amount redeemed and the card’s balance will be shown on the till receipt produced after each transaction. No cash refunds will be given. any remaining balance can be used against further purchases. The card will be valid until the expiry of 12 months from the date the card was issued. DSG cannot be held liable for lost or stolen cards or any credit amounts held on such cards. This card is not a cheque guarantee, credit, store or charge card. (cards cannot be used as payment against an outstanding balance on a credit account). This card cannot be exchanged for cash or credit.. This card is intended for personal consumer use and may not be resold or used for any other purpose. The instructions form part of the terms and conditions, as do any other printed statements made in conjunction with the DSG Insurance Replacement Gift Card. The terms and conditions listed below govern the use of your Home Electronics card. Please read the terms and conditions carefully and keep them safe. By using the card you agree to be bound by the terms and conditions set out below. What to do if your card is lost or stolen: Contact your NHS support team immediately. DSG will check your balance and issue another card with the value of the original card, subject to the following; DSG cannot be responsible for funds used without your knowledge or issue a further card where the original balance has been used. The original card will no longer be valid. This card can be redeemed in a Currys & PC World store or online at currys.co.uk and pcworld.co.uk as full or part payment towards our products or services. This card cannot be exchanged for cash or credit. The instructions form part of the terms and conditions, as do any other printed statements made in conjunction with the Home Electronics card. This card can be used as full or part payment in Currys/PCWorld (not Dixons Travel) or online at currys.co.uk or pcworld.co.uk as full or part payment towards your pre-selected products or services that are taxed at the standard rate of VAT (examples of this include energy saving devices for the home, coffee pods and similar products). Q. I have a paper voucher, can I use this online? Paper vouchers can only be redeemed in-store. Q. If I bring my product back for a refund what happens to the value paid by gift card? If a transaction paid for by gift card is refunded, the value will be refunded back onto a gift card. If the refund takes place after you receive your confirmation email you will be issued with a new gift card. Q. How can I check my gift card balance? Click here to check your gift card balance or call 0800 897 163; you will need your 19 digit gift card number. Q. When will my gift card balance expire? Upon 2 years non-use, the card will expire and any balance will be deducted, for promotional cards please see the T&C’s on the reverse of the card. Q. How many gift cards can I use online? You are able to use up to 5 gift cards per transaction. Q. What happens if I've paid by gift card and my order is refunded? If you have paid by a gift card, this value will be refunded to a new Currys PC World gift card. 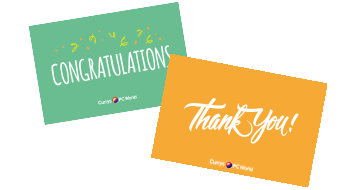 If you have part paid by gift card the applicable refund value will be split between your payment card and a new Currys PC World gift card.